The DK Rap, also known as the Monkey Rap, is a rap song about Donkey Kong and his friends, which plays every time when the player boots up Donkey Kong 64. The lyrics were written by Grant Kirkhope, and it was performed by George Andreas and Chris Sutherland. The DK Rap is very well-known for its "so bad it's good" rapping and lyrics -- an intentional stylistic choice on Kirkhope's part. The line "His coconut gun can fire in spurts. If he shoots ya, it's gonna hurt!" was once voted as the fourth worst line in a video game ever by the magazine Electric Gaming Monthly in January, 2002. The song is heavily associated with the Donkey Kong franchise and with Rareware in general; many years later, Kirkhope wrote the "Yooka-Laylee Rap" for the game Yooka-Laylee as a homage to the DK Rap. The rap starts with Cranky Kong's hands mixing records on a turntable. The sequence then cuts to the five playable Kongs in a group; Chunky Kong is wearing a 1970s-era disco outfit, only to rush offscreen and change into his regular outfit. Throughout the rap, each Kong is introduced in this order: DK, Tiny, Lanky, Diddy, and Chunky. It explains each Kong's unique traits varying from their abilities, weapons, and instruments. In each of the Kong's verses, a different instrument can be heard; DK's is a harmonica (or trumpets/horns), Tiny's is a saxophone, Lanky's is a trombone, Diddy's is a guitar, and Chunky's is a timpani. Near the end of the rap, Cranky starts to "take it to the fridge". An audience can be heard giving the five playable Kongs a standing ovation before Klump throws a grenade to the screen, ending the rap. In the lyrics of the song, the Kong's abilities, strengths and weaknesses are described to the player. However, there are some false statements throughout the rap. During the line about Tiny which says that "She can float through the air and climb up trees", Tiny is shown climbing up one of the two thick palm trees; although while playing the game in Adventure Mode, only Chunky can climb thick palm trees while using his Hunky Chunky ability. Aside from Donkey Kong being described and "bigger" and "stronger", he was also described as "faster", despite that he is the second slowest character in the game behind Chunky, due to his heavy weight. 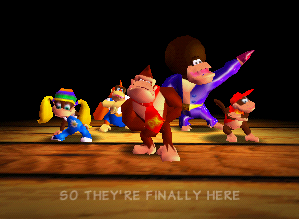 The DK Rap is mentioned in the Game Boy Advance remake of Donkey Kong Country 2, after Diddy completes the Funky's Flights mission "Cool Sounds". By returning Funky's boombox from the mission, he tells the Kongs that he can continue listening to the DK Rap all day. The DK Rap was re-recorded for Super Smash Bros. Melee, where it was performed by James W. Norwood Jr., and it plays in the Kongo Jungle stage. The third and fifth verses describing Tiny Kong and Diddy Kong are sung faster, and the word "hell" was replaced by "heck". This version of the DK Rap was featured in subsequent Super Smash Bros. titles: it appears in Super Smash Bros. Brawl as an unlockable song for the Jungle Japes stage, if the player obtains a CD for it. The arrangement returns in Super Smash Bros. for Wii U as an unlockable song for the Jungle Hijinxs stage, if the player gets a chain of 200 in Trophy Rush as Donkey Kong. In Super Smash Bros. Ultimate, the DK Rap is available from the start and can be played on every Donkey Kong series stage. In both Super Smash Bros. for Wii U and Super Smash Bros. Ultimate, the DK Rap only contains the verses for Donkey Kong, Tiny Kong and Diddy Kong, cutting the length down to just under two minutes. The Super Smash Bros. version of the DK Rap returns as a playable song in Donkey Konga. He's the first member of the D.K. crew! It's the last member of the D.K. crew! But this Kong's one hell of a guy! Come on Cranky, take it to the fridge! He's the last member of the D.K. crew! But this Kong's one heck of a guy! Grapes, melons, oranges and coconut shells! Oh yeah! This page was last edited on April 17, 2019, at 00:19.